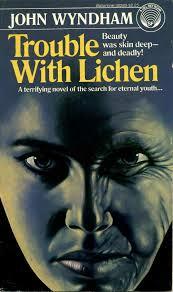 Trouble With Lichen is John Wyndham’s most explicit exploration of the uselessness of modern women’s lives. When I reread it, for what must have been the 50th time, I was surprised to see that it was first published in 1960. It reads at least a decade older than that, maybe even fifteen years, since it shares many of the plot points and social indicators of Josephine’s Tey’s Miss Pym Disposes (1946), also a novel questioning what young women should do with their lives after school, and also wrapped up with murder, biology and jealousy. Trouble with Lichen begins with Diana Brackley’s teachers congratulating her on her success at gaining a place at Cambridge with a scholarship to read chemistry. They are rather startled by her dispassionate argument that society, on the other hand, thinks that a girl is more successful if she’s bedworthy rather than brainworthy. Diana’s mother is resigned to Diana going to university, taking an excellent degree, and getting a very much sought-after job, but, really, she’s got to think of her future: how will she meet men in that isolated research station? Wyndham is reflecting a very conservative society in his alternative present-day, because his plot of altered life expectancy requires a very conservative society to be broken apart by its implications. He had long shown feminist sympathies in his fiction, since the early 1950s in The Day of the Triffids and The Kraken Wakes. In Trouble with Lichen he asks, isn’t it time we did something to rethink marriage as an institution? Diana takes her degree in biochemistry, and goes to work for a private research institution, where, one day, she notices a peculiar result from a stray contamination of some milk by a new sample of lichen just arrived from Mongolia. Her boss, Francis Saxover, says he will work on the sample, but then his ailing wife dies, and he has no interest in his work for a while, and Diana hears no more about the sample from him. She works on it privately, and comes to a very startling conclusion after months of tests and retests. The lichen has arrested the natural decay of the milk’s organic processes, and, in effect, has given it a longer life. What do you do when you discover the Elixir of Life in the modern world? 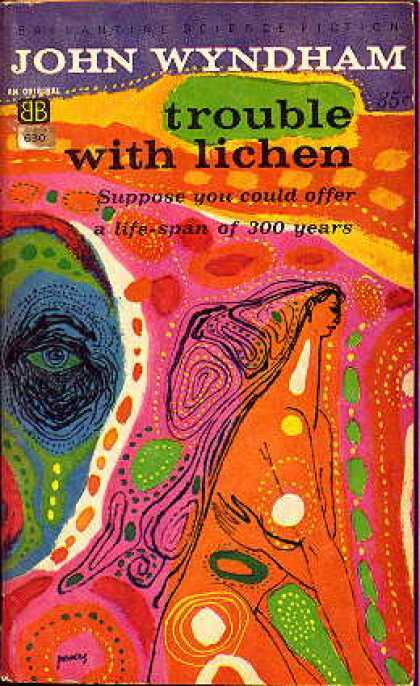 Wyndham spends the rest of Trouble with Lichen exploring how such a discovery will affect women’s lives, and their expectations of life. He could easily have launched himself on a gung-ho imperialist adventure of takeover and Americans and international intrigue for the secret, but no: he chose the far more interesting route of looking at social structures. There is a lot here about the influence of good women teachers, one of whom gives Diana the clue to her future use of the lichen: simply, to give women more time to do something in their lives. If women are expected to marry and have babies without being able to work as well, or study (for this was 1960, after all), that uses up half of their productive lives. If women didn’t leap into marriage at the age of 18 like lemmings, they might choose a husband (partner, even) more worthy of a longer married life if they knew they were going to be married for 150 years rather than 40. They might also consider studying, training, investing their brains in something more worthwhile and fulfilling than bedroom games and clothes, and increasingly desperate work to hold back the effects of age on their bodies, if they knew this was going to carry on for well over a century. If ‘you’re only young once’ no longer applies, what do you do differently? Diana’s strategy is to start by offering women the effect of looking younger for longer, setting up in the beauty business as Nefertiti Ltd. Naturally, she doesn’t tell the women she treats with her lichenin products that they are actually, really, being given the opportunity of living longer, because no-one would believe her. It’s also only an opportunity: accidents still happen, illnesses still kill, and with a longer potential lifespan, there is more chance of dying sooner than they might have done otherwise. But the lichenin products work, and Diana begins to build up a carefully selected group of women clients who are enjoying their increased youthfulness, and also beginning to realise their worth and their value in society. Self-esteem is a very powerful political tool. Diana has chosen her women wisely: since the beauty business is a luxury field, her clients are all well-off, and well-connected. None of them work since they are all married, and it’s who they are married to that matters. In Wyndham’s version of 1960 only men appear to have had political power. (Mrs Thatcher does not appear in this vision, naturally, but her early career is contemporary with the plot.) Diana deliberately creates an army of domestic and social influence to be in position to persuade the male government to allow this alarming new child of science to live, once she had been the midwife for its birth. the infantilised school of cover design? But she was not the only midwife: there is also Francis Saxover. When Diana left his institute with her secret discovery, neither had told the other that they had both reached the same conclusions about the lichen. Francis decided, in the end, to try the thing out on himself. 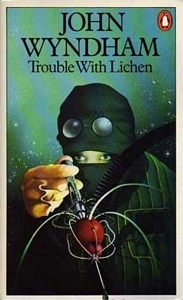 Once he was assured that it wasn’t going to harm him, he gave his two children, then in their teens, annual implantations of lichenin in their arms, with the result that, 14 years later, the three looked hardly a day older. And this is where the trouble began. Francis had not told his children what the implantations really were, but felt that he now had to, despite the terrible danger, because one of Diana’s clients had suffered an unexpected allergic reaction to her lichenin treatment, and had settled noisily and publicly for a large payoff. Attention had been drawn to the interesting youth-preserving activities, and success, of the exclusive and expensive Nefertiti Ltd, and Francis was afraid that Diana’s jig was finally up. The newspapers were taking notice, and realising that, for all the feminine frivolous nature of the business, it was making a packet, and had made a packet for a very long time in the business, and that Diana had a biochemistry degree. She clearly had a special gimmick. What was it worth? yay, more needles! or is it a pipette? Diana was well prepared, with internal security to guard against leaks, a rigidly clean anti-drugs policy so the police would stay off her back, trusted staff, and a flurry of red herrings to release to the press when needed. Francis, on the other hand, messed it all up by telling his children. In one hour only two people in the world knew what lichenin could do: in the next hour, four did. And one day later, five did, because Paul Saxover felt he had to tell his wife, the marvellously horrible and cold Jane, whose first reaction was fury that Francis would now live for much longer than she had hoped before passing the Saxover inheritance to her husband. And three days later Jane had bullied Francis into giving her an implant, sold the implant to an interested party in part-exchange for a fake, which failed to deceive Paul, and left him for good. This jig was up. Zephanie Saxover, on the other hand, has made a good choice in life partner. Her fiancé Richard does not exploit her, and gets the implant at her request. And then they are kidnapped and severely beaten up until they disclose where the lichenin comes from. By now, things were moving too fast and too aggressively, powered by greed, for the secret to be contained. Diana called a meeting of her clients to tell them what their destiny was, was interviewed on the BBC, and in view of the increasing public hysteria and misunderstanding, asked to make a public statement that evening on air. And on her way to the studio she was gunned down by a fanatic. Diana was more of an idealist and less canny than Francis: she could only see the benefit to humans in having longer to live. She could not see fully the resistance of the civil institutions (insurance companies were the first to panic), or to the stock market. She knew nothing about how ordinary people would react, and she failed to assess just how much money this discovery could make for those unscrupulous enough to exploit it. She also failed to take religious obsessives into account, and reactionaries who object to women being given this marvellous chance of extended life. That is why this novel is feminist. Women led the way of presenting the discovery to the world, and they do all the work in developing, manufacturing and delivering it. Diana’s best ally among her clients is Lady Tewson, who unexpectedly married into the aristocracy in her fourth year of medical school: she is Diana’s only confederate who understands the science. Francis is the silent, official scientific peer reviewer, whose independent work has validated Diana’s initiative, but the gift to the world was all hers. And it killed her for it. Or did it? I love this novel because of its sheer intelligence, and its intuition about how people operate. 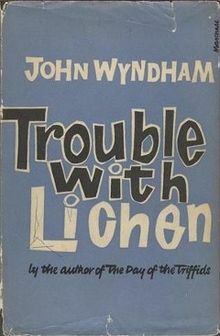 Wyndham’s characters are always unforgettably real, and his narration is often through extended sections of dialogue between different groups of people, showing, not telling. The depiction of the press and their battle for scoops and headlines is terrific, the kind of social history I spend my professional life looking for in literature. 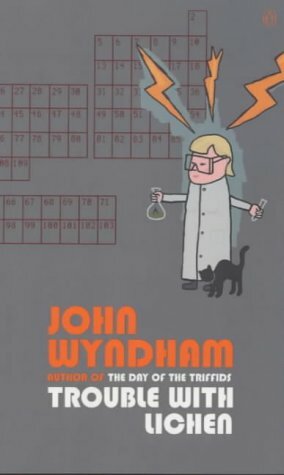 I studied one year of an undergraduate science degree when I was younger, in an attempt to make me a better editor (this was in another life, you understand), and so Wyndham’s chemistry also seems pretty good to me. I don’t care if it’s all a total invention: it READS well, and that’s what matters. Go read this book, and enjoy it as much I do. Next Post Noblesse Oblige 2: What Are U? Great review Kate! I’ve yet to read any of his work. I do have The Day of the Triffids (1951) and The Kraken Wakes (1953) (variant title: Out of the Deeps) on the shelf…. You’ve not read any Wyndham??? That makes me feel so much better not having even heard of most of the people you blog about. He’s a classic, a wonderful, prescient novelist. I’ve tried to read Out of the Deeps a few times but never got past the first few pages. But yes, I obviously know who he is but have not read any of his work yet. Out of the Deeps (Kraken Wakes) is definitely one of his great novels. Triffids, Chrysalids, Cuckoos and Lichen are the others. The rest are at the next level down, IMHO. 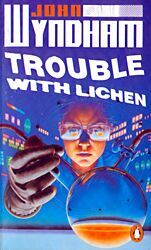 I’ve re-read ‘Trouble With Lichen’ much more frequently than anything else by Wyndham, I think, mostly because of Diana and its very female-centric viewpoint and great women characters (even the awful Jane!). Diana has a lot of very interesting things to say about society and what we view women’s places in it, particularly when she’s talking to Zephanie. The whole business at the start of the novel, when Francis is interviewing Diana for her job at Darr, and he’s worried about work being upset by the presence of women, is still going on in scientific fields (per Tim Hunt), so it’s not so much of a conservative viewpoint as one might hope (for a novel written in 1960). Hi Kate. 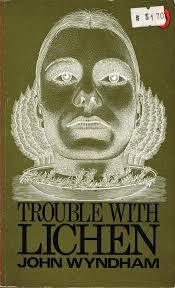 Do you know who the reader was for the Trouble With Lichen audiobook? I haven’t heard it myself. But a little light googling throws up Joanne Tope (http://audiobookas.com/audio-books/trouble-with-lichen-john-wyndham/), and I can”t find any more, so she may the reader you are looking for.